The light was soft and the bees and other beneficial insects were busily working a hedgerow of flowers as I pulled into the property. Turning to the north I saw a lush green manure crop, and beyond that, row-upon-row of cucumbers, lettuces, radishes, fennel, dill, basil, carrots, amaranth and towering sunflowers. I’d rarely seen such a diversity and abundance of flowers and food together. I was at Transition Farm, a Community Supported Agriculture (CSA) farm, on the southern end of the Mornington Peninsula in Victoria. The 7-acre (2.8 hectare) property was bought in 2011 by Peter Carlyon and Robin Koster-Carlyon who, along with their two children Maya and Rye, manage and cherish it. The climate is temperate with temperatures moderated by Bass Strait only 1km away, and Port Philip Bay not that much further. Robin’s reaction was the polar opposite. She says she looked at the soil and was dismayed. Robin’s assessment had been correct, the soil was a major problem. They immediately started work to improve it by planting green manures, starting with oats and peas, the cheapest seed they could find. The first plantings didn’t grow. Peter describes it as like trying to grow peas at the beach. But eventually some did survive, and they’d chop and drop them, and plant again. As the growing area got bigger they also deployed chook tractors and let the chooks do the chopping and dropping, as well as gently cultivating the soil. In the early stages they couldn’t till because the soil was too fragile. They spent 3–4 years on different parts of the property, growing green manure crop after green manure crop to build soil. Biodynamics was the next step and vital, says Robin. Apart from green manures the only fertilisers used are their own chook manure and compost, and the biodynamic preparation BD 500. Autumn: Broad bean, chicory, clovers, lucerne, lupin, oats, plantain, rye and vetch. Summer: Buckwheat, clovers and millet. CSAs are one of several regenerative farming methods here and overseas based on nurturing the environment while providing locally grown produce to communities. Not only do they build food security, they address climate change. In 2011, the UN Special Rapporteur presented a report ‘Agro-ecology and the right to food’ before the UN Human Rights Council. The report demonstrates that agro-ecology, if sufficiently supported, can double food production in entire regions within 10 years, while mitigating climate change and alleviating rural poverty. 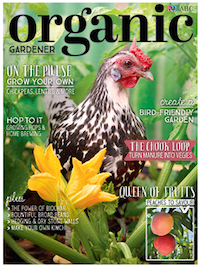 For the full story on Transition Farm, get your copy of the July/August 2017 Organic Gardener magazine OUT NOW!